The below review by Robyn Walton (although slightly modified) was previously published in The Australian. Last year crime and mystery readers were impressed by the high calibre of The Rúin, the first novel of Irish-Australian lawyer Dervla McTiernan. Now we have a sequel, The Scholar, and readers can be assured it is just as engrossing. In what promises to be a series situated in and around Galway, some recurring features are becoming evident. First is McTiernan’s concern for children neglected, abused or traumatised and her interest in how they address challenges in early adulthood. Second is the sense of being in capable authorial and investigative hands. McTiernan’s narrative pattern so far has been to introduce an already-troubled child or children soon after a parental death then create a puzzling police procedural set a decade or two later. These storylines show children who are disturbingly calm, almost mute and old ahead of their time. And they include touching instances of siblings helping each other in the absence of parents providing loving protection. The Rúin’s memorable prologue, an emotionally engaging and intriguing piece of writing, introduced a 15-year-old girl and her 5-year-old brother marooned in a decrepit house with their dead mother. 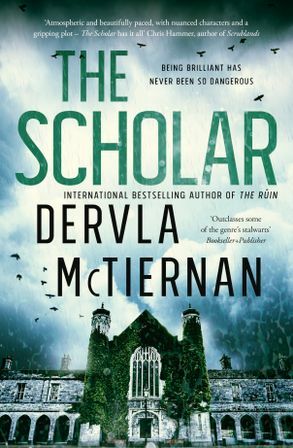 In the prologue to The Scholar we are with 12-year-old Carline Darcy, an only child in the care of an au pair, as she learns from a TV report that her self-indulgent father has been killed. Carline appeals to her uncaring grandfather, a Big Pharma tycoon, but is rebuffed. This lead-in is flatly written, the intention perhaps to convey the girl’s emotional condition, and initially it’s confusing. Prologues are not always enticing or necessary. Carline resurfaces as a stylish undergraduate studying bio-pharmaceutical chemistry and keen to impress her grandfather by way of her scholarly brilliance and readiness to claim a role in the Darcy Therapeutics empire. When police begin investigating a fatal hit and run near the privately funded and secured Darcy facility on the Galway university campus, the fact that detective Cormac Reilly’s partner, research scientist Emma Sweeney, works in this lab and found the body flags both opportunities and compromising partiality for Cormac. And Emma’s background, which includes an experience of horrific violence when she went to the aid of her teenage sister, proves relevant. Carline’s trajectory is paralleled by that of another young woman, also bright but disadvantaged. Unloved by a harsh mother, Della Lambert left home at 16 to support herself and seek a tertiary education. The Henderson case running simultaneously also involves child harm: a husband and father has prepped his house in readiness for piping in carbon monoxide gas. Cormac is not above inventing a controlling father in his own childhood when trying to induce this man’s wife to admit her oppression. McTiernan is a thorough author, careful with her structuring, plotting, pacing, consistency of tone and language choices. Credible settings and socio-economic realities prevail. The unspoken background to The Scholar is Ireland’s hundreds of pharmaceutical and biotech corporations employing thousands and generating billions in turnover despite the long shadow of the global financial crisis. The stakes are high for ambitious players developing new drugs and devices, yet the day-to-day culture that McTiernan depicts is quiet. Within the Darcy facility, long-standing resentments go unaired. Fellow workers scarcely know each other. Problem-solving preoccupies, night and day. Elsewhere, McTiernan’s people are also reticent, self-effacing, more sly than blatant or brash. Collective interludes of high spirits (tenants’ partying, a students’ end-of-exams dinner) occur off the page. Unlike the hard-living, risk-taking protagonist of McTiernan’s fellow Irish-Australian crime author Adrian McKinty, Cormac is a subdued and subduing character who keeps his strongest emotions hidden and can command compliance. Not having been used to failing when he worked in a specialist role in Dublin, he now wants to master a big, live case in Galway rather than remain lumbered with cold cases. Having scored the hit-and-run case he stubbornly hangs onto it, batting aside both observations about his conflicts of interest and his superiors’ coded reluctance to permit any probing that would aggravate the powerful John Darcy. Also, Cormac reasons that, if he controls the investigation, he can better protect Emma, who has suffered nightmares since the Dublin incident and is struggling to cope with the fresh scenario. In the first novel there was a sense of pervasive crookedness in addition to the usual station politics. This time, although Cormac knows he still cannot rely on the uniformed police for help because he has not yet earned their trust, his closer colleagues seem honest enough, barring one resentful middle-aged woman. Able to pick his offsiders, Cormac goes for young Peter Fisher, who’s generally willing to do as he’s told and is quick on the uptake (though sometimes too hasty to arrange or assume before he has considered consequences and alternatives). Reticence characterises private relationships as well as public. The Cormac-Emma bond is reputedly strong yet, while the two treat each other gently, lies are noted and doubt and mistrust intrude. Readers may wonder whether the relationship can last, especially when both characters have been displaced from the capital into a regional city where they lack family and long-time friends to act as confidants and mediators. In the hands of Cormac and Fisher the dual investigations of the hit-and-run and the attempted gassing murders steadily push forward, with a few not very successful excursions into accounts told from other points of view. Agatha Christie-style subterfuges involving disguises, hotels and cars will amuse some readers. When Cormac’s official progress on his hit-and-run case is halted by Internal Affairs, it is Cormac’s peer, Carrie O’Halloran, who must step in, with Cormac becoming a lowkey maverick through to the denouement. Carrie is a brisk multi-tasker, her style more direct and human than that of the clipped Cormac. This is the second Cormac Reilly book and I’m hoping there are many more to come. Cormac Reilly is working in Galway and being given ‘dead-end’ jobs by his boss, Brian Murphy, in an attempt to make him move on. However, his colleague Carrie O’Halloran is under the pump and asks Murphy to reassign some of her cases. Murphy assigns a difficult one, the Henderson case, to Cormac, again hoping he will fail. Taking over this case will also see him undermined by one of his own team who is incensed that this case has been taken away from Carrie, even though she had made no progress in the time she had had it. This colleague will also do everything possible to undermine him as he investigates a new case. While Carrie was briefing Cormac on Henderson, another case comes in and Cormac makes his first mistake by agreeing to take the lead in the investigation. Cormac is now investigating two cases, and attempted murder of a mother and her children (Henderson) and a murder of a young PhD student working in her grand-father’s laboratory (Darcy). The Henderson plot examines violence against women and children and how difficult these cases are to investigate due to the reluctance of the victim to believe the facts about someone they believe loves their family and wouldn’t do anything to harm them. The Darcy murder plot revolves around the decisions made when loved ones are involved in the case and questions whether or not objectivity can be achieved, or are assumptions made that influence our actions. It also looks at what can happen if even a moment of doubt creeps into the relationship. It also explores how the circumstances of our birth impact on our lives into adulthood and seeking approval from another can lead us to act dishonestly and eventually to death. Cormac is a flawed character who has both supporters and detractors within the office. His detractors are active in their attempts to undermine him, which makes life difficult but some of the decisions he makes play right into their hands. I started this book one Friday night thinking I’d read a few pages before bed! I finished it Saturday afternoon, very sad that it had ended. I just couldn’t ration my reading! I wanted to read it slowly to savour the brilliant writing but I kept being led on to the next page. The various threads established early in the book had me wanting to follow them through to the end. I loved it and can’t wait for the next Cormac Reilly book.